On May 20th, 2016 the Honoring the Spectrum of Self exhibition began with an opening night of planned and spontaneous performances. 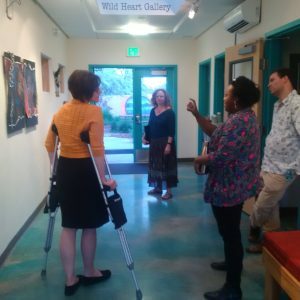 Spoken word, song, and video filled the large art therapy classroom and vibrant conversations filtered into the Wild Heart Gallery, where guests could examine the installed works of Chelsea Call, Elijah Chong, Beth Lykins, Jessica Morris, Crystal Norberto, and Brittnee Page. Heather Leigh, Brittnee Page, Marc Paley, and guest investigate the gallery exhibition. 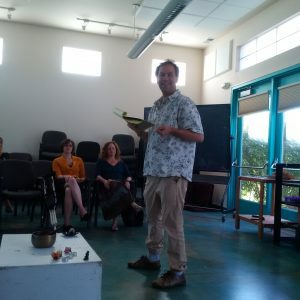 The night’s theme was an investigation of the sacred pieces which formed the journey of knowing the self, community, and other, including values or beliefs which shaped one’s individual identity, as well as recognition of the belonging to the collective. Much of the work was inspired from the experiences in the first year classes of Multicultural Perspectives in Art Therapy/Counseling with Diverse Populations and Archetypal Psychology. 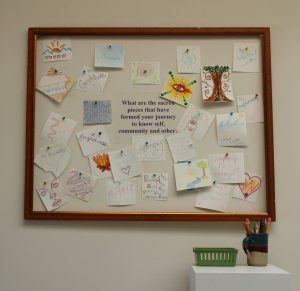 An interactive piece was located on one wall of the gallery, where audience members could express their ideas on the questions of self with provided drawing media. Subsequent blog posts will feature artist statements and images from many of those who participated in the installed exhibition. Honoring the Spectrum of Self ran through August 8, 2016.